MERCERVILLE, Ohio — For now, the bragging rights belong to the Lady Raiders. 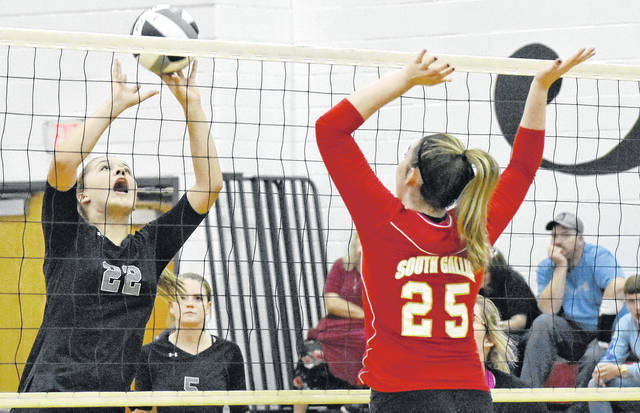 The River Valley volleyball team earned a three games to none victory over non-conference host South Gallia on Thursday night’s contest between Gallia County squads. The Silver and Black (2-1) surged to a 6-1 advantage in the opening game, but the Red and Gold (1-2) managed to cut the deficit to just three points at 7-4. RVHS, however, manufactured a 10-point, 20-10, advantage en route to a 25-15 win. The second game was tightly contested, as South Gallia knotted the game at 3-all early in the contest. River Valley, however, built is largest led of the contest after pulling ahead by seven points at 15-8. SGHS utilized a 12-7 scoring run to cut River Valley’s led to just two points at 22-20, but the Lady Raiders scored the next three points of the game to earn a 25-20 win. 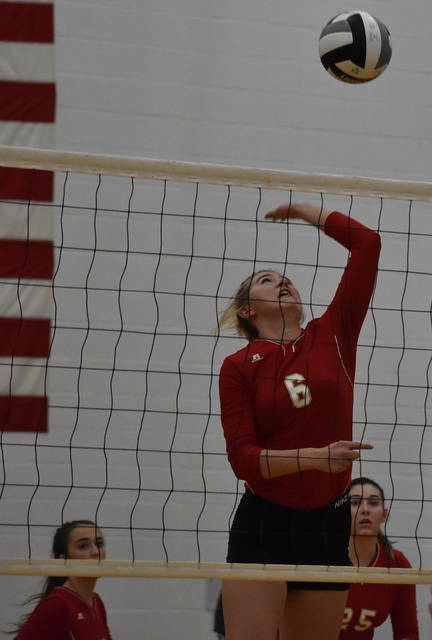 Following a 3-all tie in the third game, the Lady Rebels jumped to a 15-11 advantage before utilizing a 10-3 scoring run to close out a 25-14 victory. The Lady Raiders service attack was led by sophomore Mikenzi Pope 20 points and junior Alex Woods followed with 10. Kelsey Brown and Rachel Horner were next with five points apiece, respectively, while Lora Kinney followed with three. Kasey Birchfield posted two points, while Cierra Roberts rounded out the River Valley service attack with one point. The Lady Rebels service attack was led by senior Rachal Colburn with 10 points, while Amaya Howell was next with five. Makayla Waugh posted three service points, followed by Emma Shamblin with two. Rounding out the South Gallia service attack was Christine Griffith with one point. The two teams are scheduled to meet again on Oct. 1 in Bidwell. The Lady Raiders return to action on Monday as they travel to face Southern, while the Lady Rebels return to the hardwood on Tuesday to host Tri Valley Conference Hocking Division foe Waterford.